Is there still Mackerel on Chesil and when do the Mackerel leave? These are the two most common questions that I hear at the moment. The good news is the Mackerel will stay around for at least another month yet. I find it strange that most people stop fishing for Mackerel when the kids go back to school after their summer holidays. I have caught Mackerel all the way into January a couple of years ago. I know that is unusual, but catching them in October and even November is not that unusual. I often catch them at this time of year, on float fished Mackerel strip, whilst fishing for Garfish. I mentioned that Codling had been caught from the beach last week. I got an email from a friend who was lure fishing around Portland Bill. He managed a few Pollock as the light started to go. However he witnessed a spear fisherman land a 20lb Cod at low water. The diver said that the fish was only 20yds out. I would love to have caught that on a lure rod, sounds like it is time to break out the Rhubarb and Custard Sidewinders. More news of unusual fish, with reports from Total Sea magazine, that a couple of young lads landed a Sturgeon from the shore in South Wales. There is photographic evidence to back up the report of the 1m long fish, but it has not been released yet. 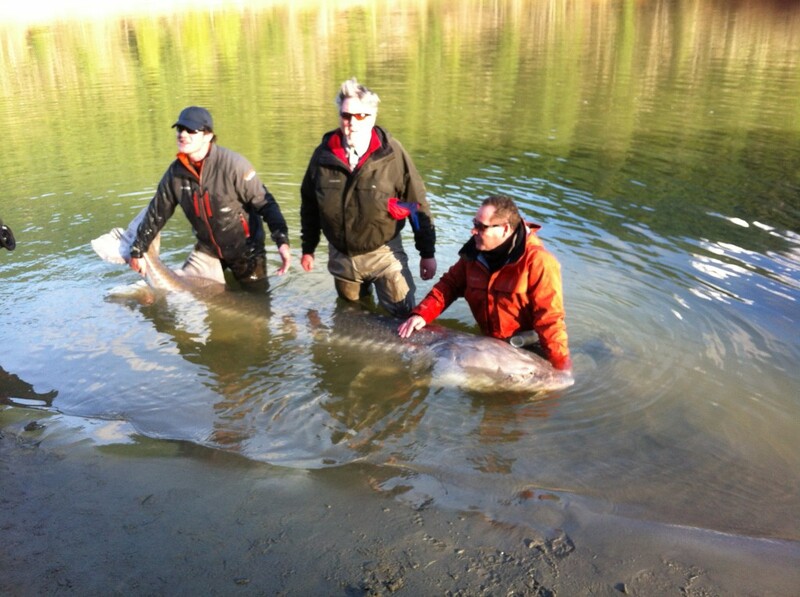 I will share with you the picture of the 1100lb fish I caught around this time last year in Canada. Experts believe the Sturgeon may be of the European variety, and could have migrated from the Gironde River in France, where there is a program to brea and release the Sturgeon. It is illegal to land Sturgeon in this country. 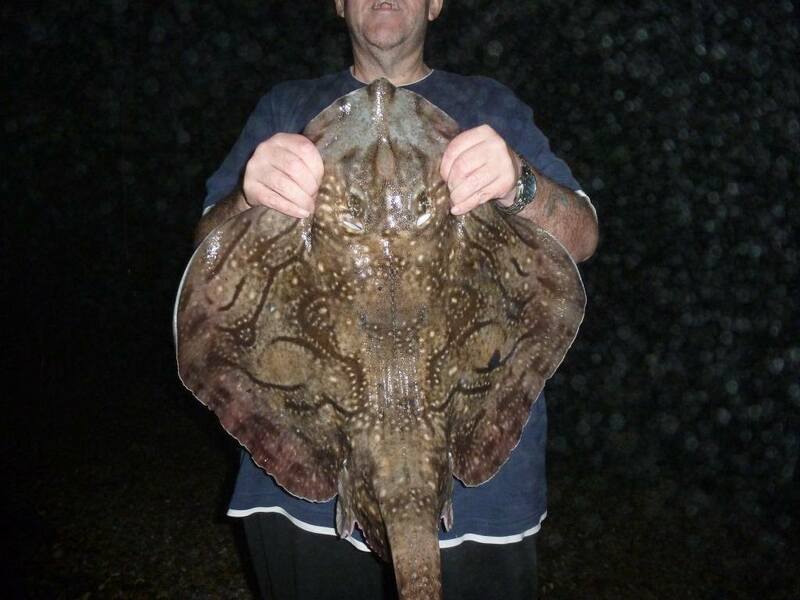 The inshore fisheries management team, have asked anyone who catches it to report it to them. It is possible that we may see a number of them turning up in estuaries around the UK this year. A less unusual, but equally impressive fish was landed by Kevin Clarke from the Portland end of Chesil Beach. 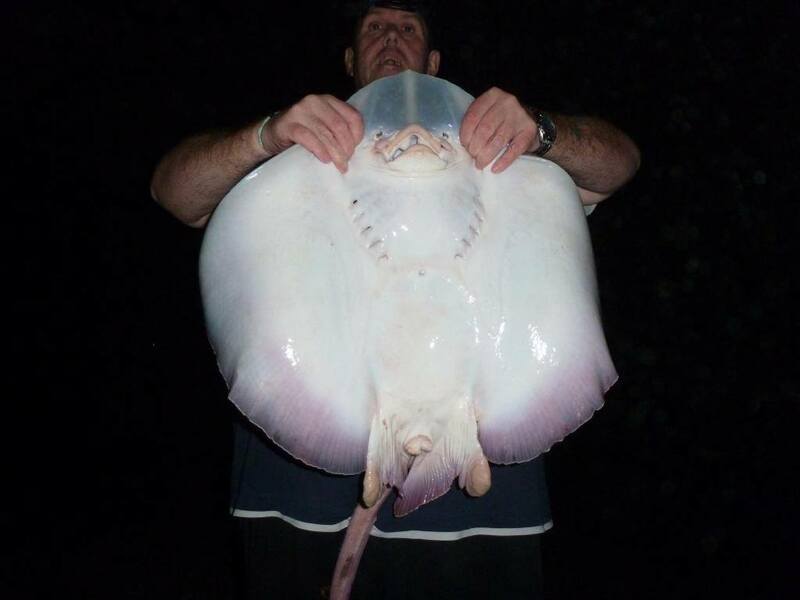 He landed and returned an Undulate Ray that certainly looks like a potential British Record. He did not have any scales to weigh it and wanted to return it back into the water as soon as possible. He caught it on 2 dirty squid on a 4/0 Pulley Pennel rig, very close to the shore. Chesil Beach forecast: The current Northerly wind, is not the most ideal of winds as it blows straight across the beach. It is a bit rougher in Chesil cove, producing better conditions for Bass. Further along the beach there is a good chance of Bream ad Trigger Fish from the Ferrybridge area. The Sole fishig has dropped off for the past couple of days, but Plaice and Gurnard are still being caught at Abbotsbury and West Bexington. Garfish and Mackerel should be plentiful and can both be caught on lures or float fished Mackerel. Portland: This evening should be good for a Pollock at dusk. Chances of Wrasse on soft plastic lures is not high, due to the wind. It is more difficult to control the slow speed of the retrieve required for Wrasse, when the wind is about 14mph. Bait fishing with Ragworm will improve your chances. Night tides will be good at Church Ope for Bass, Dogfish, Pout, Rays and Conger. Portland Harbour: North Westerly winds are about the worst wind you can get for fishing in Portland Harbour. It blows the bait fish away from most of the accessible areas. Flounder can still be caught in most of the harbour. Another great report. We are off on a fishing trip down Chesil in couple of weeks and very happy to here from your post that the mackerel are still around. Plenty of joey mackerel at Abbotsbury yesterday late afternoon until 7.30pm. They were feeding off brit / sandeels? at or near the surface (sending the gulls crazy!) anywhere from 10 – 40 meters. I used a feathers with light lead sink & draw, but the northerly wind was too strong for fly fishing – my preferred method as so much fun!